Want to build your skill set and marketability as an engineer and designer? If you do then showing the right experience and certifications is critical. Still, since most software work on similar underlying principles, it’s possible to translate some skills. 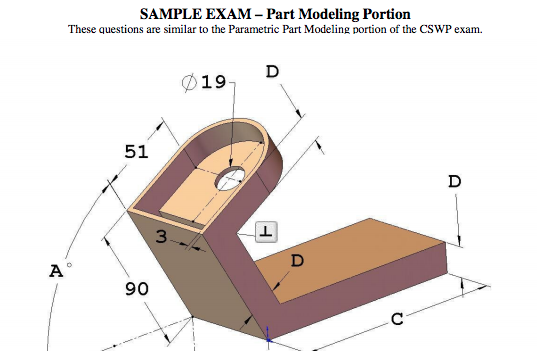 This is what led me to attempt some of the Solidworks exams using only Onshape. Onshape is free, but requires that you keep designs public at that level. It does not have a formal certification it does make it easy to share a portfolio. Things like the CSWP (Certified Solidworks Professional) will not guarantee you a job but can make the difference or catch some attention. The same can be said for your public documents on Onshape. Being able to use a CAD software suite is key to designers and developments engineers. Many job postings and organizations look for this when hiring, and typically focus on their product of choice. If you have not built a public portfolio, had direct experience in the right software, or formal training it can be hard to showcase skills. These needs to showcase proficiency in a tool is what led to certification tests. Solidworks is a market leader in this field and now boasts over 100,000 registered. Still, the software costs over $1000 just for 3 months of access, so finding alternatives is key. The CSWP CORE 2008 exam PDF used for this study. Setting up the document properties is key to getting the right answers. Above is how to do that in Onshape, and how to manually check the answers using a clauclator since it is not possible to always get the right desnisty from the limited material selection. Shelling works exactly the same in Onshape as it does in Solidworks. Here’s a quick sample with the exam problem on how to create the feature. Same thing goes for extrudes and cuts. Pretty basic stuff if you have worked in any CAD software. The design intent is much more critical. I can’t say that my methods on the sample are correct, but they are functional to get the right design and mass properties. Here too is the basics of sketching and setting up the variables. Onshape still lacks design tables, which would make going from question 1 to question 2 much easier. Setting it up with variables though does make it fairly easy to change dimensions. Want More CSWP and Onshape Tips and Insights?